I was emailed by a company called Wholesale Costume Club, http://www.wholesalecostumeclub.com/ – Costumes for Halloween, to see if I would review one of their costumes (single item only, max retail of $35) free of charge! Yay! 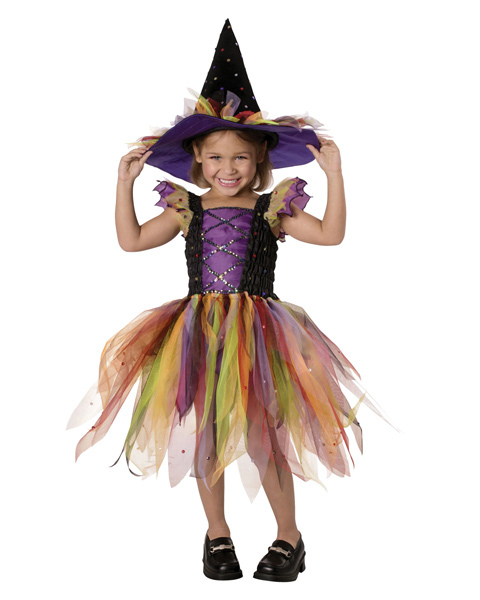 After looking at their hundreds of costumes, for both adults, children, and even dogs (all of these available in multiple different sizes)...I chose a really cute dress up outfit for Destin to wear...the Glitter Witch. I loved the couples costumes, but my husband & I hardly ever dress up :P (Even though I wish we did! I love Halloween!). So why would you buy a costume online, when you can just go to the store & buy the same thing yourself in person? Well normally, this costume would cost you over $32 in the store, but if you bought it online you could save at least $10 or more (depending on the costume you get). And as an added bonus, if you are someone that buys costumes more than once a year, or maybe you have a large family that would need a lot of costumes - you can become a member for just $5 more (a one time fee) & get the costume of your choice even cheaper! Wow! So to review the costume...after taking it out of the package, (which contained a dress & a witch hat) there was a lot of loose black strings everywhere...not sure from where? I don't know if the dress was falling apart or what? The dress itself needed to be fluffed out to look wearable (which was to be expected). But it seemed kind of small to be size 2-4 (as the pkg states). Honestly, it was pretty snug. If you have ever met my daughter (who will be 2 in one month), you will know that is pretty small - very skinny, still wearing size 18 mos & under. Also if you compare the pic of my daughter below, and the pic on the costume packaging...it doesn't look the same dress. The fluffy part of the dress is flat, and long, and my daughters was tangled, and some of the strands were tied together. The hat was way too small as well...we couldn't even put it around her head :( It kept falling off, and to take a pic of her I had to quickly place it on, and hope that she wouldn't turn or look down - or it would just fall to the ground. I got Destin to smile just for a few minutes..then she immediately wanted to take the entire outfit off. She kept saying "I don't like it! Its too small." If I ever buy from this company again, or if I am offered another product up for review, I will be sure to order a bigger size. I just figured it would be big like all the rest of her dress up clothes/costumes that she has received over the past few months (from our nieces & for Christmas). Who knows, maybe they will read this review & let me try another product from their company for free again - so I have a better peace of mind & a good feeling when thinking of Wholesale Costume Club. To sum up, thank you Wholesale Costume Club for letting me review one of your costumes free of charge! I would love to try your company out again, and I would totally recommend you to my friends & family for their future costume needs. You do a remarkable job of selling costumes at wholesale price - much better than just buying it at the store.